Raise your hand if you’re excited to dive into this GF Crunchy Chocolate Chip Granola with me! If you haven’t noticed yet, I’m obsessed with amaranth right now. This ancient grain has made a comeback in the Shaw Kitchen like you wouldn’t believe. It started with the Buddha Bowl, then that Peanut Butter Parfait, and now this GF Crunchy Chocolate Chip Granola. I’m on a roll and I can’t stop-won’t stop, so I encourage you right now to write AMARANTH in big caps on your grocery list for the week. Or, if you’re like me and looking for that Simple Swap, head on over to 5 AM to buy the pre-popped version so you don’t have to worry about the mess and task to pop it yourself. You can get the popped Amaranth I’ve been using at 5 AM. And no, I don’t have a financial relationship with them, I just love their product! But, if you’re more of a go-getter, then by all means, pop your own! 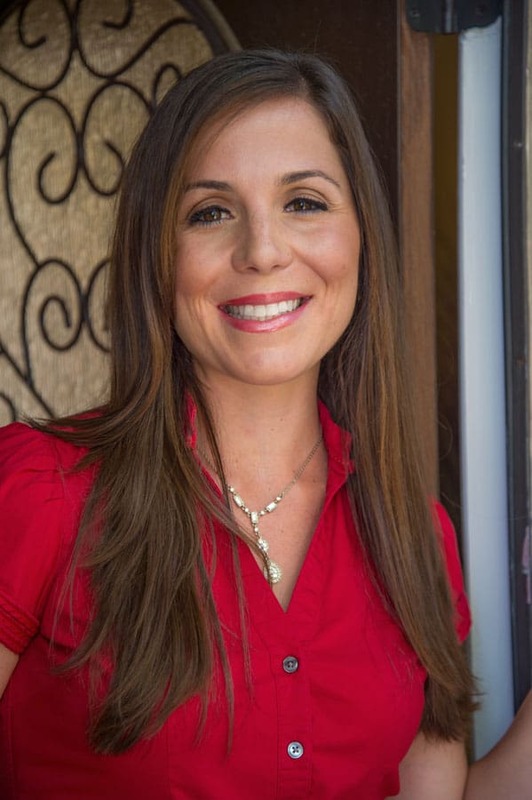 Here’s a great video on how to do so (Click Here). Now, did my obsession with powdered peanut butter finally meet it’s match? Only time will tell, but it’s looking good! Anyways, what made me decide on this GF Crunchy Chocolate Chip Granola? The answer is simple. I realized I’ve been holding out on you for far too long. I have never posted a granola recipe and you my friends and fellow followers needed to know how simple it is to make this at home. This GF Crunchy Chocolate Chip Granola is seriously To Die For! I now understand why bloggers say they have to make multiple batches when testing granola. Yep, I too ate the ENTIRE batch solo in my first round of testing. See, I was really sacrificing for you to come up with this recipe. My waistline does not thank you, but my taste buds do! Now, the good stuff. 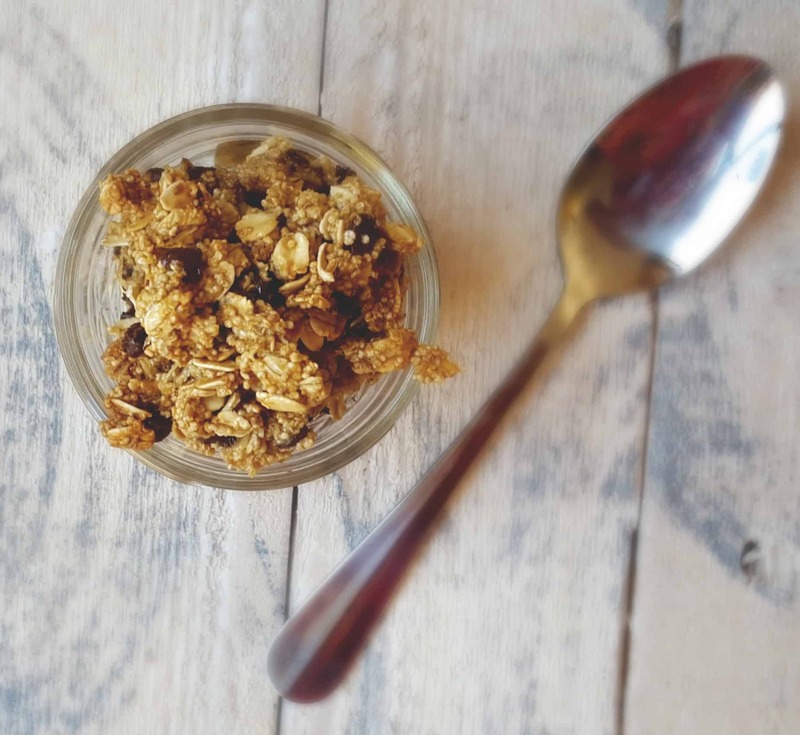 This recipe is packed full of fiber, protein and if you eat it in moderation (aka 1/4-1/2 cup), you will be well under the caloric value of a traditional granola. This recipe has 80 calories per 1/4 cup serving and less than 2 grams of total fat! 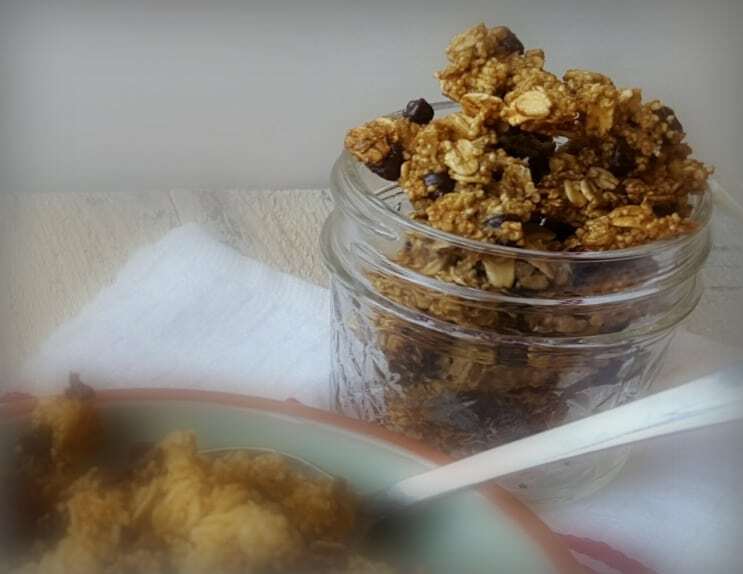 GF Crunchy Chocolate Chip Granola is perfect to top your yogurt with, serve up in a bowl with milk, or simply portion out a handful and mix in with your popcorn– the possibilities are endless! If you like CHOCOLATE (which I’m fairly certain you all probably do), check back Wednesday because I’ve got a special edition pudding to serve this granola with! Dive into this crunchy, chocolately goodness with a big ole' spoon! 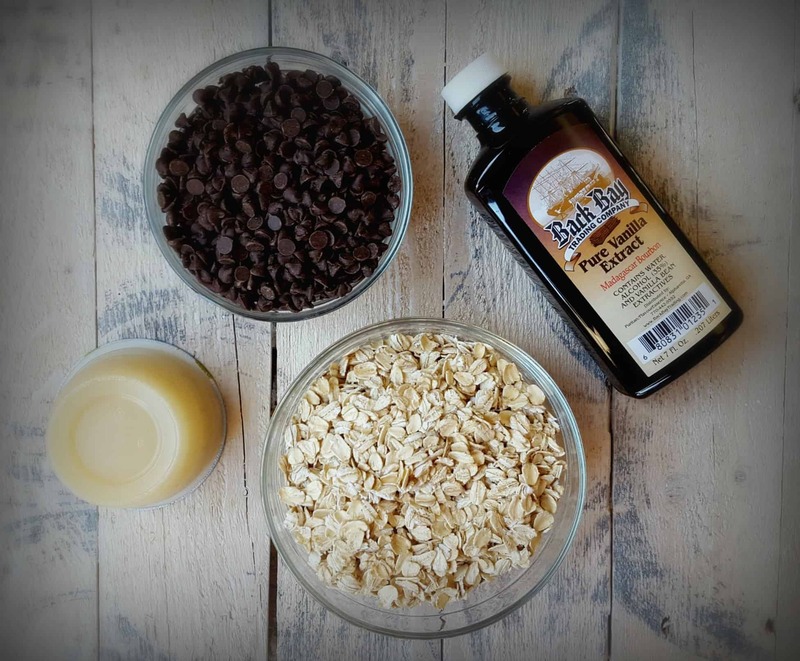 GF Crunchy Chocolate Chip Granola is all you need to start your morning off right! In a medium bowl, combine amaranth, oats, chocolate chips, vanilla, applesauce, sugar and butter. Stir with a spatula until evenly mixture is evenly coated. Heat oven to 350*F and spray a cookie sheet with cooking spray. Spread wet mixture evenly onto cooking sheet, making sure a thin layer is formed. Place in oven and cook for 18-20 minutes. What’s your favorite way to use granola? Fun recipe! 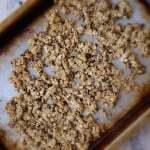 I’ve been thinking about making some granola lately, so your recipe is the perfect inspiration. I’ve never added applesauce to my granola before, but sounds like a great idea! I love this network- seems like we’re always getting inspired from eachother! What a way to make a living, right?! I love applesauce, I add it to everything! There’s always room for chocolate! 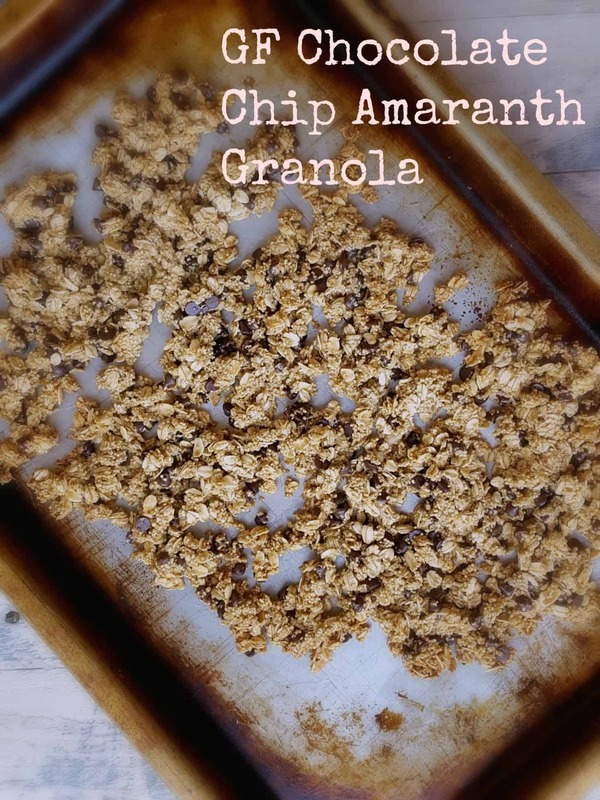 Another recipe for me to try amaranth! I really need to get on that!! I’ve tried making granola a couple of times and they’ve been fails, but I’m gonna cross my fingers and give this one a go – it just sounds too good to pass up! The secret is to use the popped amaranth in the baking- trust me, I wouldn’t lie to you! In the meantime, whip it up with some of your quinoa on hand and see what you think! LOVE the apple sauce addition! I’ll have to try that next time I make granola! YUM! A little stealth health move- but just the right amount of sweetness and liquid to make it work! This granola looks so good Liz! You know I have a bag of Amaranth in my cupboard just waiting to be used… I still need to try it! This granola looks right up my ally. Amazing! Let me know how you do with popping the amaranth! I’ve never done it that way, only the prepopped variety! Ah yay! I hope you enjoy Sonali! Yum, yum, yum! I adore granola! Thanks for a new recipe Liz! Can’t wait to make the recipe. But where do you get the popped Amaranth? I know that Whole Foods had the grains but I have not seen the popped.? Appreciate your reply.